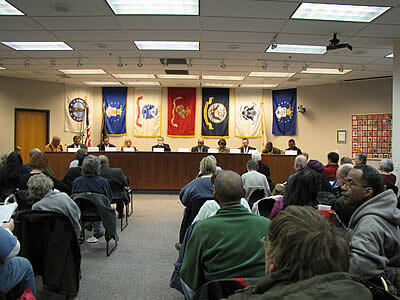 Park Forest, IL-(ENEWSPF)- The League of Women Voters of the Park Forest Area announced sponsorship of several forums for candidates in various offices throughout the area. The first is today at Village Hall in Park Forest. The complete list as received from the League of Women Voters follows with some locations yet to be announced. Jan 13, Village of PF trustees and mayor, Park Forest Village Hall, 1-4 p.m.
Feb. 2, Village of University Park trustees and mayor, 90 Town Center, 2-4 p.m.
Feb. 9, School District 163, Park Forest Village Hall, 11-12:30, p.m.
Feb. 9, School District 227, Park Forest Village Hall, 1-2:30 p.m.
Feb. 9, Prairie State District 515, Park Forest Village Hall, 3-4:30 p.m.
Feb. 12, Park Forest Library Board, Park Forest Public Library, 7-8:30 p.m.
Feb. 16, Village of Olympia Fields trustees, TBA, 2-4 p.m.
Feb. 21, Crete-Monee School District, TBA, 7-8:30 p.m.
Feb. 23, Village of Matteson trustees, Matteson Community Cente, 2-4 p.m. Possibly March 16, Village of Sauk Village, TBA. Poll: Who do you plan to vote for in the 2012 U.S. Presidential election?